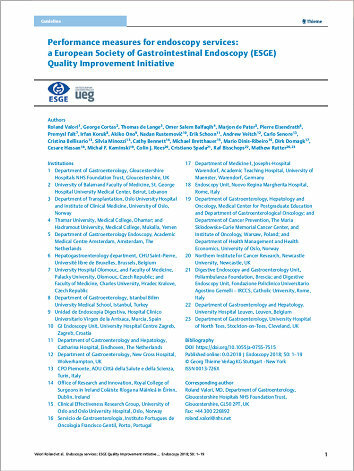 The European Society of Gastrointestinal Endoscopy (ESGE) and United European Gastroenterology present a list of key performance measures for endoscopy services. We recommend that these performance measures be adopted by all endoscopy services across Europe. The measures include those related to the leadership, organization, and delivery of the service, as well as those associated with the patient journey. Each measure includes a recommendation for a minimum and target standard for endoscopy services to achieve. We recommend that all stakeholders in endoscopy take note of these ESGE endoscopy services performance measures to accelerate their adoption and implementation. Stakeholders include patients and their advocacy groups; service leaders; staff, including endoscopists; professional societies; payers; and regulators. The quality of gastrointestinal endoscopy is important to patients. It is known that there is considerable variation in the quality and safety of endoscopy, indicating significant room for improvement [1 – 3]. Historically, the focus of quality and safety has been on the performance of individual endoscopists, with the definition and measurement of performance metrics, and the use of these to target interventions designed to improve performance. There has been less focus on the environment within which endoscopists work, and the role or responsibility of an endoscopy service in the quality improvement cycle. An endoscopy is part of a patient’s diagnostic or therapeutic journey. What happens before and after the procedure impacts on his or her experience and safety. An endoscopist performs the procedure, but he or she is dependent on a team to perform the procedure well and safely. Thus, the quality and safety of endoscopy depends on the environment within which endoscopists work (including the facilities and equipment) and the staff who work in that environment. Individual endoscopists and their staff have to be aware that there is room for improvement, believe that improvement will make a difference, be motivated to improve, participate in further development, and finally audit that improvement to ensure the required level has been achieved. The endoscopy service has a key role to play in providing high quality, safe, and patient-centered endoscopy. Collecting performance data and feeding it back to endoscopists provides metrics that may be used to target interventions designed to improve performance; for example, by motivating endoscopists to change their practice; providing time and opportunity to improve; possibly by in-house training; and finally by applying restrictions if the individual does not achieve the requiredlevels of performance. Such ongoing monitoring, in the context of an understanding of the roles and responsibilities that an endoscopy service has in the quality improvement cycle, should lead to continuing improvement. Within this context, the purpose of this guideline is to provide recommendations on what an endoscopy unit should have in place to meet these requirements. It is recognized that the recommendations may require new roles and information gathering systems, and that there will be implications for the types of staff and staffing levels. Therefore, to achieve the recommendations, there will need to be extra resource allocation. Moreover, we appreciate that an excellent patient experience, and high quality and safe endoscopy brings potential savings. This guideline provides explicit recommendations about what is required to deliver a modern endoscopy service. We recognize that payers, the organizations within which endoscopy services sit, and those who allocate resources, as well as those who work within the service already understand the importance of quality.